Women rights defenders have stood up for change across the Middle East and North Africa in 2018 despite a plethora of abuse from governments and armed groups, Amnesty International said Monday. Paying tribute to women activists in a report released on Human Rights Day, Amnesty said they had been “at the centre of compelling stories of hard-won change”. Women in Iran, Saudi Arabia, Egypt, Morocco and the Palestinian territories had taken part in protest movements “and felt the backlash of authorities’ anxieties about those challenging the status quo”. Amnesty said 66 women human rights defenders had been detained this year in Iran, 14 in Saudi Arabia and three in Egypt. “From successfully campaigning to lift the driving ban in Saudi Arabia to protesting against Iran’s abusive and degrading practice of forced hijab, women across the MENA region have been standing up,” said Heba Morayef, the rights group’s director for the region. Amnesty singled out “the outrageous arrest of Amal Fathy amongst many other women activists” in Egypt. She had been “arbitrarily imprisoned since May simply for posting a video online speaking about her experience of sexual harassment and criticising the Egyptian government for neglecting survivors”. In the Palestinian territories, activist Suha Jbara had described “how she was tortured by her interrogators in the Palestinian security forces over the course of three days in November”. She said she had been “beaten, slammed against a wall and threatened with sexual violence, as well as punished for going on hunger strike”. Philip Luther, Amnesty’s MENA research and advocacy director, gave a positive balance for the gains of women in the region. “Despite the shortfall in international pressure, the hard-won gains of women human rights defenders in this and previous years raise hopes that more change is on the horizon,” he said. 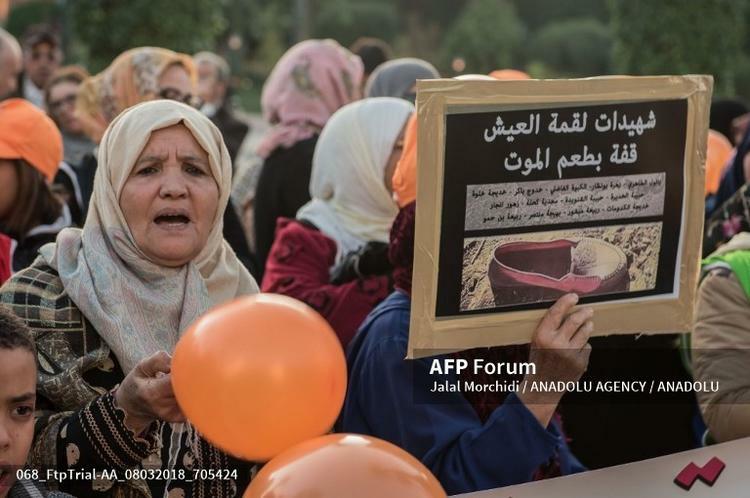 Featured Photo: RABAT, MOROCCO – MARCH 08: Women take part in a protest on ‘violence against women’ regarding the International Women’s Day in front of Parliament Building in Rabat, Morocco on March 08, 2018. Jalal Morchidi / Anadolu Agency.